What may be the longest award show ever, with a three+ hour run time, the Grammys were star studded and ready for war. YOU KNOW IT’S A GREAT NIGHT WHEN KANYE LETS YOU FINISH. First, let’s talk attire. It seemed like everyone had the same idea in mind: dark palettes—blacks and burgundys and navy blues. But then there was Pharrell, who has abandoned his signature vintage Westwood hat for a glow in the dark suit. His suit glowed in the dark and hardly anyone noticed, just as much as nobody noticed his #BlackLivesMatter ode in his “Happy” performance—how cool is he. And then there was Rihanna, always one to stand out of the crowd, with a bombastic hot pink prom dress. She was hard to miss to say the least. WHICH WAS ONE, IF NOT THE, MOST AMAZING MOMENTS OF THE ENTIRE NIGHT. President Barack Obama made a guest appearance to inform us on domestic violence right before Katy Perry gave a surprising and emotional ballad performance centered around “By The Grace of God.” Beyonce literally looked like an angel as she sang gospel hymn “Take My Hand, Precious Lord.” And by the time it was over, everything and everyone seemed unified. Other performances were Ariana Grande, Madonna, Eric Church, Usher ft. Stevie Wonder, Ed Sheeran ft. John Mayer, Sia (ft. Kristen Wiig!) and Kanye West performing both “Only One” and then “FourFiveSeconds” with Rihanna and Paul McCartney. Although there were less than 10 awards that were openly presented, the biggest star of the show was undoubtedly and respectfully Sam Smith, who took home four awards—the night’s biggest winner. First for ‘Best New Artist,’ a highly sought after award, ‘Record’ and ‘Song of the Year’ for “Stay With Me” and finally ‘Best Pop Vocal Album’ for “In The Lonely Hour.” He himself deemed the recognition of his art as the “best night of his life,” as it’s well deserved. Besides the complete disregard to acknowledge any hip-hop category, there was rarely a discrepancy in who’s who in the music world. All of the odds added up in the end. Finally, Beck was awarded ‘Album of the Year’ for Morning Phase, which seemed to surprise him as much as anyone else, seeing how Ed Sheeran, Sam Smith and Beyonce shared this nomination. Assuming that no one took the time to examine Beck’s “artistry” before criticizing the decision, the man writes all of his songs and plays fourteen instruments. Anyways, as Prince awkwardly said his name, Beck made his way to the podium, and just a few seconds later, so did Kanye. Talk about anticipation and the immense horror you could see across the entire audience’s faces. Hilarious. Kanye retook his seat and let Beck finish. 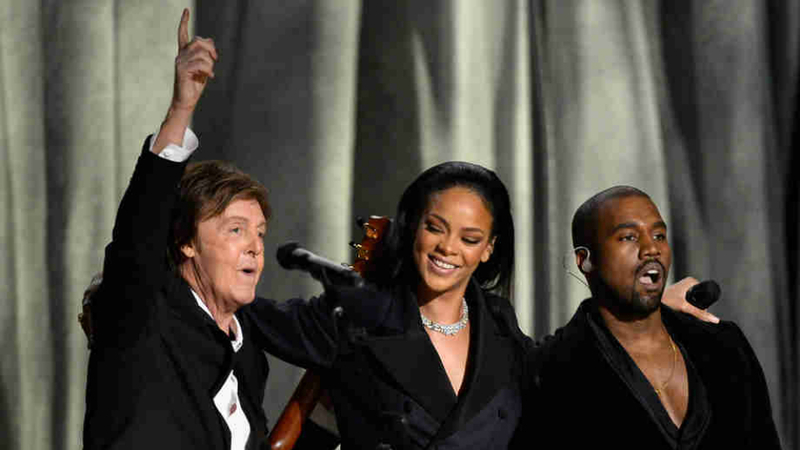 The 2015 Grammy Awards felt like a genuine good time that broke both the ice and barriers. Is LL Cool J going to host the show forever? What was your favorite performance? Let me know on Twitter @HappyIsFeet or in the comments.